Since 2008 Tonia Alexander has been a volunteer for The Women’s Initiative’s Challenge into Change Writing Contest, an annual celebration of women’s stories of hope and healing. As a member of the Challenge into Change Committee, she helps guide the vision for the program and the culminating event at the Virginia Festival of the Book, our largest outreach event of the year. A Senior Self-Sufficiency Specialist at the Department of Social Services, Tonia also continues to inspire her clients to share their stories in each year’s contest. Tell us about how you got involved with The Women’s Initiative originally. This year’s Challenge into Change book debuts at the Virginia Festival of the Book. I have always found myself looking for resources that would serve my clients—something sustainable in the community that they would be able to access long after their time with me. I first found out about The Women’s Initiative when I was looking for a resource for a client who was dealing with major depression and I was trying to find a place that was very welcoming to her. The Women’s Initiative was nearby, so we were able to walk over and inquire about the services that were available. Charlottesville has a lot of resources, but it was great to have a resource directed towards serving women. We were able to make use of several opportunities available right from the beginning. What inspires you to volunteer for Challenge into Change? Over the years I have found that sometimes people will not be successful as they move towards self-sufficiency because of the additional stressors they’re dealing with. It has felt great to be there for these women—not only are they able share their stories in writing but their voices can be heard. How would you describe the impact of the Challenge into Change program on the authors who participate? Every woman’s story is different, and it has made each book different over the years. Whether you’re sharing the first book or the most recent, there is always a woman that the book is able to speak to. Challenge into Change creates a connection between the authors and the readers that you can’t find in other books and I think that’s powerful. To be able to read the words of women from our own community, our own neighbors, to have an opportunity to share an encouraging word with a neighbor or a sister in a town that continues to heal, that is impact in itself. All are welcome at this year’s Challenge into Change Celebration on Wednesday, March 20 at Carver Recreation Center. This article is adapted from our 2019 Winter/Spring Newsletter. For National Poetry Month in April, we're celebrating poems that inspire us and speak to the work of our agency: empowering women in times of challenge and change. To begin, we are featuring "Where I'm From" by Rebecca Ballard, below, a poem included in the 2016 Challenge into Change Writing Contest, an annual program that encourages women to write and share their stories of transforming challenges into opportunities for change and growth. Stay tuned for more as we are getting ready to unveil this year's Challenge into Change book at our Challenge into Change celebration on April 18. We invite you to this special evening to celebrate the process of storytelling as healing. Follow The Women's Initiative on Facebook and Instagram to keep up with the latest. This is the week! Be a part of an incredible celebration of women's strength and resilience: Submit your essay or poem today to the Challenge into Change Writing Contest. We're accepting stories of a woman in your life (yourself or someone you know) who has transformed a life challenge into an opportunity for change. Entry deadline is this Friday, December 15. Winners receive cash prizes and all authors are honored at the 2018 Virginia Festival of the Book. Click here to submit now. The Women's Initiative 2017 Challenge into Change Writing Contest is accepting entries through Friday at https://t.co/Z9bB9qV6PG Tell your unique story; perfect grammar and spelling are not required. In the lead-up to this year’s December 15 Challenge into Change deadline, we’re revisiting the stories of resilience, hope and growth writers shared with us in 2016-17. 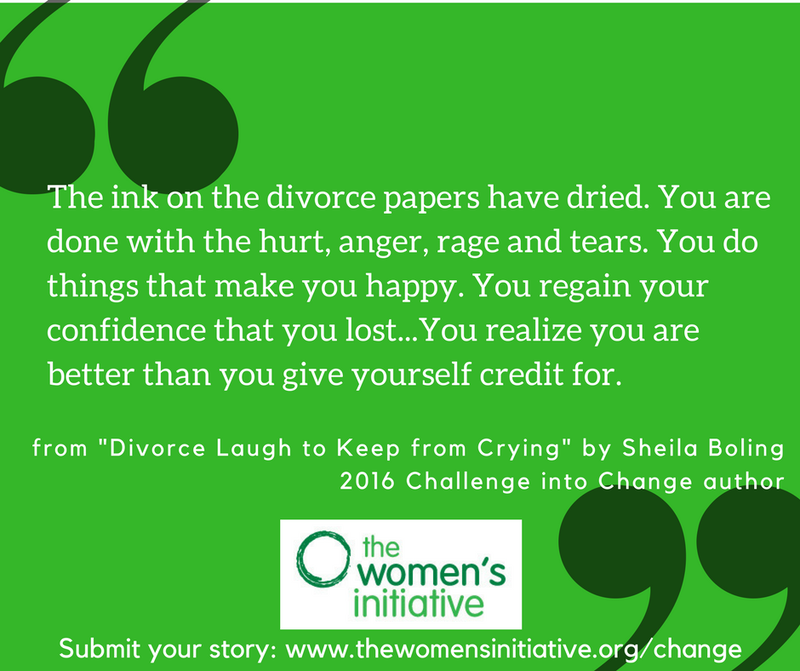 In this essay, Sheila Boling shares difficulties and wisdom from an experience of going through divorce. Sometimes when you go through a divorce you just have to laugh to keep from crying. When you get married to stand before God, family, friends and you vow to be with that person until death do you part. You say I do and things are going well. Then suddenly the things that brought you together are the very things that tear you apart. No matter how you tried to stay together you just can’t get past things that were done or said in anger. You may realize you are not compatible at all. So you separate for 3 months or 1 year depending on your assets or if you have children, etc. During this time you try to put the pieces back together. You look at yourself and reflect on things that went wrong. You think about the things that your spouse/partner complained about can be changed. You decide if you can make the changes without changing who you are as a person. You even try counseling because in all honesty no one wants their marriage to end. You meet and try to work things out. However, you realize that you can’t work out the issues. More things are done or said to make it in impossible. Now here is where the three stages of divorce come in the good the bad and the ugly. Stage 1: The hurt that your marriage failed and you are getting a divorce. You have to listen to what people are saying. The typical things I’m sorry it didn’t work out. Oh what happened? The favorite he or she wasn’t the right person for you but I didn’t want to hurt you. You looked so happy. You cry and cry some more because it didn’t work out. Stage 2: The anger and rage because it has ended. You are mad be-cause of the mean and hurtful comments. You are mad because people keep running to tell you that they saw him or her and they were with someone. You are mad because when the holidays come around you think about the engagement or the marriage. You reflect on the goods times because it was not all bad. Then you are even madder. At times you are mad when any man or woman even tries to talk to you. You chew them out and spit them out. Then you laugh because otherwise you will be crying. Stage 3: Moving on… The ink on the divorce papers have dried. You are done with the hurt, anger, rage and tears. You do things that make you happy. You regain your confidence that you lost. You regain your self-esteem. You realize you are better than you give yourself credit for. You look back and you just laugh at what you did or the way you acted. You are no longer the deranged divorcee. You pick up the pieces and you move on. You ready to go on with your life. You have moved on when you want your ex to be happy and meet someone. You have moved on when you know you may not have been the right person for them. People think that women should wear divorce on their forehead like a badge of honor especially if you have been married more than once. They will say third time a charm, haha. So you smile and say you never know. They repeat themselves and you smile and say the same thing. You really want to say something mean. You laugh to keep from crying. You have moved on when you open your heart up to new adventures, new people, and new desires. So don’t think of divorce as a bad word. You have come through the trauma of divorce and are now on the other side. Your story will speak to so many. There is encouragement here for women considering, or currently going through, a divorce. The DIVORCE acronym helped to pull the author’s writing together, taking a word that can include much hurt and sorrow and using positive, uplifting words to define it. In this piece, the author reflects on the challenges of divorce and the stages by which one may overcome these. The prose moves confidently and powerfully, taking the reader vicariously on a journey of frustration, despair, and into redemption and confidence. I live in Covesville, VA and was a twin. I lost her to breast cancer so I run the Women's Four Miler because of her. I enjoy running, gardening and gathering with friends and family. Amanda and Aerial on the air with DJ Max and Charles. Thanks Razor for the picture! There is just over one month left to submit your story to our annual writing contest celebrating the power of storytelling as healing, Challenge into Change. This weekend on 101.3 JAMZ “In My Humble Opinion,” previous Challenge into Change winner Aerial Perkins talked about her essay “Pretty Brown Girl” and inspired others to write their stories. Submit your essay or poem by December 15. Contest rules & online submission portal can be found here.